Plus a list of the fastest-growing healthcare careers. Realityworks' Health Science tools give students real-world, hands-on learning opportunities that address health science occupations, career exploration and skills training. Health science careers make up more than half of the top 20 fastest-growing occupations nationwide. Projections show that the United States will need 5.6 million more healthcare workers by 2020. 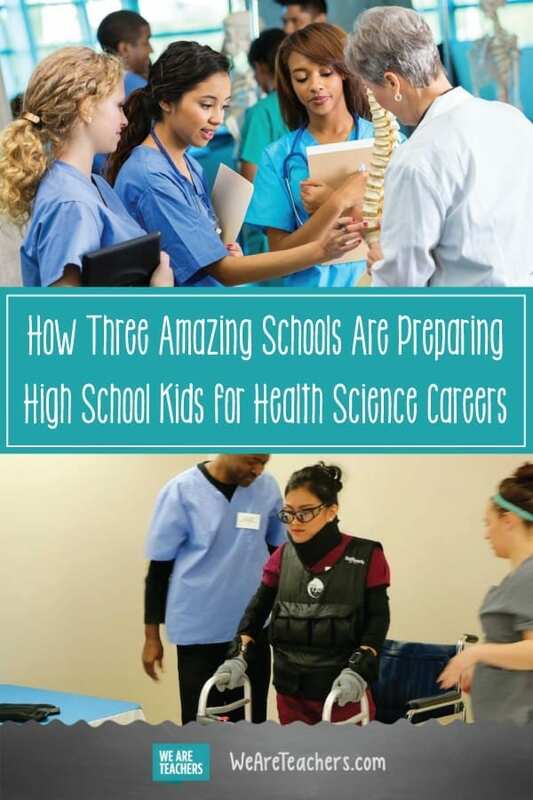 It’s no wonder that more high schools are offering programs to help prepare students for careers in the medical field. Here’s a look at three schools offering successful and innovative approaches to healthcare education. Thomas Edison CTE School has a long history of offering healthcare-related programs. It is the only school in New York City with a medical assisting program approved by the state education department. While the courses offered prepare the 2,100 students for various careers, the medical assisting program is extremely popular. Dr. Margaret Savitzky, a medical assisting instructor at the school, points to several key reasons why the program is so successful. Students can leave with certification. There are layers of learning that need to occur before a student is ready for a health science career. And as students continue through the program, all those layers build upon each other and get increasingly advanced. “Students come back to visit. They tell me that the program gave them a very solid foundation to help them in their studies,” says Dr. Savitsky. In addition to book learning, the students regularly conduct activities that let them practice essential skills, such as vital sign measurements, venipuncture, capillary puncture, ECG testing, urinalysis, pediatric measurements and visual acuity testing, and pulmonary function testing. Prior to completing the program, “students are offered the opportunity to participate in volunteer internships with local healthcare facilities to see healthcare practice in the real world,” says Dr. Savitzky. 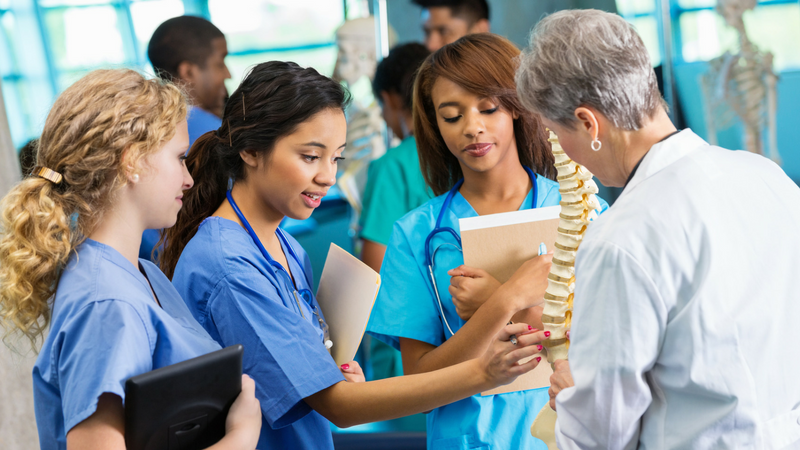 This allows students to fine-tune their areas of interest, get a glimpse into working in a health science career, and establish relationships with potential employers. As the only CTE school in Nicholas County, Nicholas County Career and Technical Center has been readying students for nursing careers since its inception 30 years ago. While the school offers nine different career paths to its 300 students (who come from two different feeder schools), the nursing program fills up quickly. 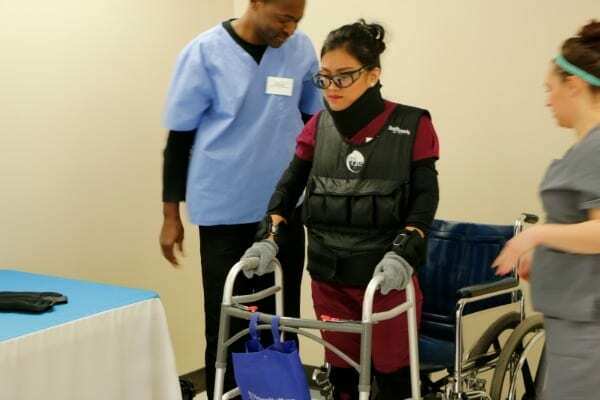 The nursing program is known for its use of cutting-edge learning technology, such as wearable age simulation suits that enable students to experience a variety of age-related physical challenges. “Healthcare classes are very popular at our school,” says Mandy Kessler, a health science career education instructor at Nicholas County CTE. “All of our students go through an application and interview process to be accepted into our programs, and this year I had over 60 applicants for the 20 spots in my class.” Mandy chalks that demand up to several defining factors of the program. “Students in all of our CTE courses are part of Simulated Workplace, an educational initiative in West Virginia that allows students to transform their classrooms into real-world companies,” explains Mandy. “Students are assigned roles just as they would be in the workplace. They are expected to carry out these roles, such as director of nursing, nursing assistant, safety manager, etc.” This setup helps students take charge of their role in their education. They get an idea of what their workplace environment could be like. Some healthcare classes help students get ahead by also providing high school credits. “Once a student completes two years, or four semesters, of the health science course, they receive a science credit because we teach so much anatomy, physiology, and other science concepts,” explains Mandy. “We try really hard each year to have grant money available. We try to pay for the students’ certification exams, which can become costly. They are sometimes as much as $200 to $300 per exam. The grants make it so the course and certification never costs the student anything,” says Mandy. This ultimately makes it more feasible for students to leave the program and begin a health science career with certification. Serving students from multiple high schools in the Chippewa Valley area of Wisconsin, Bobbly Scanlon, a nursing educator with Dove Healthcare, teaches courses on becoming a certified nursing assistant as well as various CPR, assisted living, and memory care courses. During her three decades of teaching, Scanlon has honed in on what works in the classroom. Programs are structured to create the most successful experience for her students. Day and evening courses are available. Bobby has seen an enrollment increase in the certified nursing assistant courses. In order to serve as many students as possible, courses are offered at various times to work around students’ schedules. “We offer day and evening schedules. That works for them while they work a job or go to school,” says Bobby. Her classes include students as young as 15, high school juniors and seniors, and adults. Students walk in the shoes of the patient. In hopes of helping her students better understand their older patients, Bobby relies on the RealCare™ Geriatric Simulator from Realityworks that lets the kids physically experience what it’s like to be elderly by replicating limited tactile sensations; impaired hearing, vision, and mobility; stroke paralysis; and geriatric skin conditions. Students get equal time in the classroom and the labs. Giving students the opportunity to actually practice on real patients is crucial. “The majority of the learning in the healthcare field happens working with people. They take what’s learned from the classroom to the people,” says Bobby. “The course I teach is 120 hours. My students get equal parts classroom and labs. In labs they’re practicing the hands-on skills needed to work the 40 to 50 hours of clinical time with actual elders.” Schools need to “allow for greater clinical time versus keeping students in front of a computer or in a classroom,” she says.